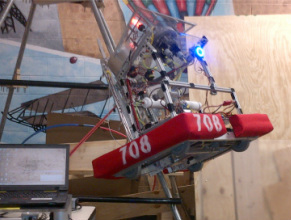 Team 708’s 2013 robot is designed to be a very competitive robot in the 2013 Ultimate Ascent game. Our strategy focuses mainly on offensive tactics in our approach to the game in that we try to score rather than prevent other teams from scoring. We collect the Frisbees from the feeder station using a polycarbonate funnel that loads the discs into our hopper. A flipper knocks the bottom Frisbee from our hopper into the shooter and it is then fired using a rotating shooter wheel. In the last 30 seconds of the match we are attempting to climb all three rungs of the pyramid using four extending arms with ratcheting fingers.